New interdisciplinary research from i-sense at UCL and published in ACS Infectious Diseases in June, explores the potentially important role llamas and their family (camelids) could play in developing tools to detect early stage HIV. HIV currently affects more than 34 million people worldwide and is constantly evolving, which presents difficulties when developing vaccines and diagnostics. Postdoctoral Research Associate from i-sense’s McKendry Group at UCL, Dr Eleanor Gray, says, “The prevention of HIV and other infectious diseases is a global priority and driving force for the continued development of advanced nanotechnologies capable of diagnosis at point of care. “We know that nanobodies, which are made from antibodies found in the immune system of the camelid family, make good tools for diagnostic test because they are a tenth of the size of traditional antibodies. 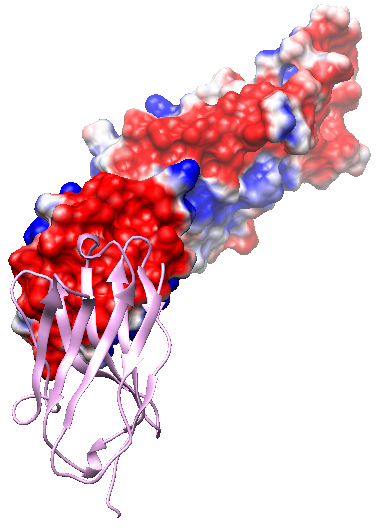 By borrowing expertise from professionals at IBS at Grenoble and QVQ in the Netherlands, the research characterised the relationship between nanobody 59H10 and p24 (pictured right) to pin-point the binding properties important in understanding the molecular process needed for the design of suitable components of diagnostic tests. Dr Brookes explains that if solving a scientific problem is like solving a puzzle, you need to have all the right parts in place to get the solution. This collaboration helped examine the binding event between a nanobody and a HIV antigen, look at the characteristics of the relationship of this binding, and understand the physical properties that enable the binding. Dr Gray goes on to say that combining the efforts of others meant being able to build a strong case. “Having three different areas of expertise involved – structural biology, virology, theoretical biophysics – meant we could benefit from different perspectives from various disciplines. Although the paper focuses of the use of nanobodies against HIV, the principles of the research could be applied to a broader range of disease areas like influenza, Zika, Ebola, and antimicrobial resistant bacterial infections. Why is early detection of infectious disease important? Incidence and mortality for HIV is highest in Sub-Saharan Africa, however, prevalence in the UK is high and around one in five people are unaware that they are infected. Early detection is key in treatment and prevention of the disease, allowing people affected by HIV or other infectious diseases to receive appropriate care and to prevent risk of subsequent infection to the wider public. Research shows that early diagnosis and access to antiretroviral treatment increases life expectancy by 10 years and, in the UK, could result in savings to the health system of more than £11,000 per person, per year. Victoria Brennan, Stephen Beard, and Christian Hill. The public health and economic impact of early diagnosis and early HARRT treatment for HIV in the UK. Technical report, 2011.